both worked right off after I obtained the firmware. 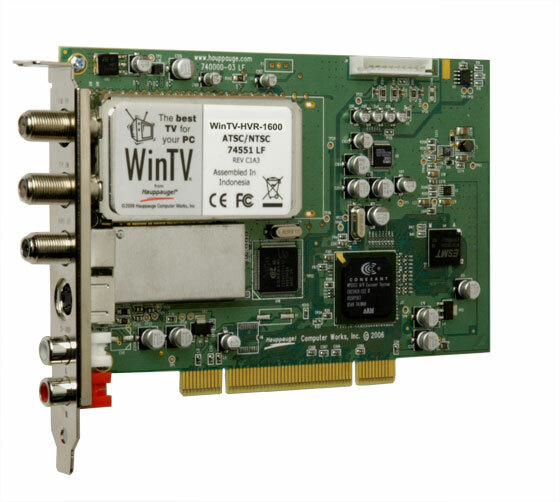 The HVR-1600 has a separate input for Digital (ATSC), Analog (NTSC) , and FM Radio. I used a splitter to feed the Digital and Analog inputs since I have only 1 antenna. See picture to the right - Top is Digital tuner, Middle is NTSC, and bottom is FM tuner. I am using them to tune over the air channels in North Vancouver (mainly the HDTV channels available). The one thing that took a bit of playing was the channel file that holds the frequencies of the stations available. I the updated the Call signs to be more readable. NOTE: I also had to change the 'VSB_8' to '8VSB' to make it understood by VLC. CBC, CTV and Global are in High Def! Wow The Simpsons in Hi-def is awesome. I also have MythTV 0.22 installed and recording fine! Right now I am using a roof antenna, however I am planning to build a Modified Gray Hoverman. Take a look at how easy and cheap it is to build. These people at digitalhome.ca really know their stuff and have shared a tonne of good info. I think I am going to build a GH8. I will post pictures here when I get it built.